Ask WeBikeEugene: Who Yields at ‘Bike Path’ Crosswalks? I had an interesting interaction with a car driver a few weeks ago at the intersection of the Fern Ridge Bike Path and City View St, where the path has a grade level street crossing and also switches sides of the river. This interaction went far better than an interaction I wrote about last summer, but also raised an interesting question: Exactly who has the right-of-way when the bike paths crosses the road with a crosswalk, the biker or the driver? In practice, whoever has the right-of-way at these crossings really doesn’t matter. The WBE-recommended method for handling these crossings on a bike is to slow down, make eye contact with any approaching drivers, and then do whatever the driver expects you to do – either cross or stop. Obviously if they stop, you go, and if they go, then you stop. This method keeps everyone alive and happy, and has served me well for years – but what does the law say? 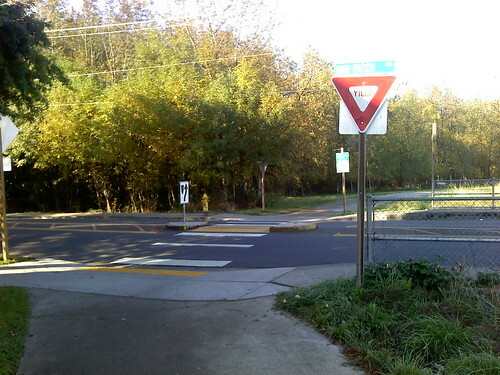 Author C-GirPosted on October 26, 2010 October 26, 2010 Categories infrastructureTags ask wbe, ask webikeeugene, crosswalks, fern ridge, laws5 Comments on Ask WeBikeEugene: Who Yields at ‘Bike Path’ Crosswalks?